Inspired by the All Species Day spectacle in Vermont the author explores how the arts can be an effective bridge to unite us to the natural world in which we live. Personalized learning is a way of tapping into the interests, desires and enthusiasms of the young people in our communities, and putting these to work. In this article, Rolstad and Kesson share their experiences of trusting children, of giving them the space and the resources to learn and grow in the ways that are best for them, comparing along the way what it was like to unschool then and what it is like to unschool now, in this era when our society has come to distrust children more than ever. In the summer of 1983, the author purchased a twenty-acre plot of land in Paradise Township, an historic Oklahoma settlement nestled between the Tallgrass Prairie and the foothills of the Ozark Mountains. 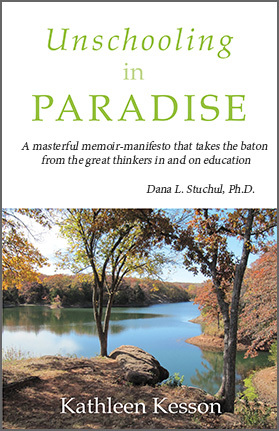 Lacking adequate educational options for their four young boys, the family commenced on a five-year experiment in “unschooling.” This chapter from a forthcoming memoir chronicles her journey from Romantic notions of “being one with nature,” to co-existing with “the real deal, in all its teeming, hairy, ugly, creepy, crawly, slithering, slimy, swarming, buzzing, biting, sucking, stinging glory.” The article makes the argument that contemporary children need to be immersed in observations of and experiences with all sorts of creatures, even those that are “downright hostile to humans and ugly to boot,” if they are to develop a deep understanding of the natural world. This paper elaborates on James MacDonald’s theory of the ‘transcendental developmental ideology of education,’ and expands the boundaries of conventional thinking about the professional development of teachers by suggesting attention to what Carl Jung called the “individuation process” (spiritual and transpersonal development). in The Journal for Critical Education Policy Studies. This paper looks at how teachers in low-performing New York City schools experience their professional work lives, using the concept of alienated labor as a lens through which to understand the problem.